While a Central Europe itinerary can include a number of countries, my three-week road trip in the Czech Republic, Slovakia, Vienna, and Krakow was a great way to explore this fascinating – and often overlooked – region. My 2018 Central Europe itinerary featured the Czech Republic (Czechia), but also included a few days in Slovakia and the cities of Vienna, Austria, and Krakow, Poland. The full itinerary, with lodging and dining information, is below. Start planning your own trip right here! Aside from a few days in Salzburg, Austria, a number of years ago, I’ve never traveled in this part of Europe. Thus, the 2018 TBEX (Travel Bloggers Exchange) conference in Ostrava, Czechia, conference was a great excuse to “Czech” it out. The most common Central European tours usually cover Prague (in the Czech Republic), Vienna (Austria), and Budapest (Hungary) – all cities I’d love to see. But big cities and summer heat (and crowds!) aren’t a great mix. So, instead of spending all of our time in the region’s major cities, my husband and I decided to drop Budapest from our itinerary. Instead we planned a Central Europe road trip with a nice mix of historic cities, small towns, and scenic countryside. We began in Prague, where we rented a car on our way out of town. From Prague we drove south through the castle country of Bohemia and on through a bit of South Moravian wine country. From there we dropped down to Vienna for a few days of history and culture. Then it was back on the road, driving through mostly rural Slovakia, and on to Krakow for a few more days of city life. From Krakow we made the short drive down to Ostrava in the far northeast corner of Czech Republic. 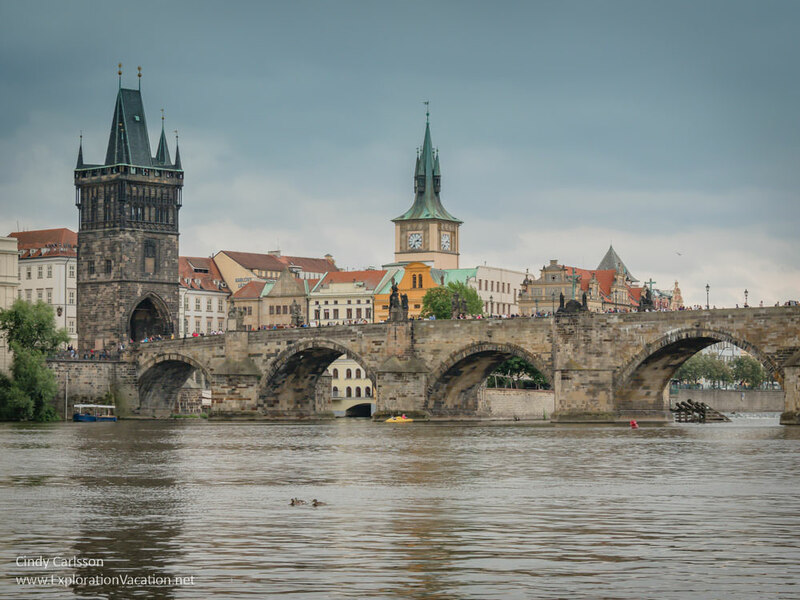 I stayed there to attend the TBEX conference and travel a bit more in the Czech Republic while my spouse returned the car and flew home from Prague. You can see where I went (and a few places I hoped to get to, but didn’t) on the map below. there is lots to see! Prague is a very large city and not all of the most interesting sights are in the Old Town UNESCO World Heritage site. However, while three days is not enough to really get to know Prague, it offers a nice introduction to the city. We hit a few of the city’s highlights, but mostly just wandered around soaking in the atmosphere in the Old Town area. Whether you know it or not, when you hear “Art Nouveau,” you probably imagine art by Alfons Mucha, as his highly stylized female figures came to symbolize the style. Prague is Mucha’s hometown, and the city overflows with Art Nouveau art and architecture. You can find it it along the streets and in museums, galleries, and even churches! 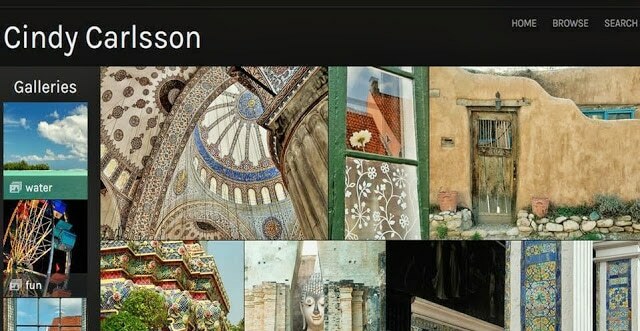 I signed up for Airbnb’s Best Photo Spots in Prague tour with Callum. The tour took us to great overviews of the city, into the Prague Castle compound, along the Vltava River, over the Charles Bridge, and finally to another spot along the river for sunset. While none were particularly unknown spots, it was a great mini-tour and I got a few good shots. Prague is filled with churches, most of which are fully open to the public. We visited a number of them, including Saint George’s Basilica and Saint Vitus Cathedral at Prague Castle (both in Prague Castle), Saint Nicholas’ Church on the Market Place, the Church of Our Lady Before Týn, and the Convent of Saint Agnes. While that may seem like a lot of churches, there is a surprising amount of difference between them. And there are more to see. Prague’s Old Town Hall is best known for its Astronomical Clock (which was off being repaired when I visited) and the tower (which provides fabulous views over the city). However, the interior of the building itself is also well worth a visit for its wonderfully decorated historic meeting rooms and halls. While the views are great, it’s worth going inside too! Yes, we visited a beer spa. This isn’t something we would usually do, but a (younger) cousin highly recommended it. And he was right. Yeah, it’s super touristy and not “authentic” in any way. But it was weirdly wonderful and oddly relaxing to sit in a tub of warm beer ingredients (it’s more like sitting in a tub of herbs than in a tub of beer) while drinking great local beer. The Beer and Wine Spa Lázně Pramen has romantic private rooms and all the light and dark beer you can drink. (There’s a tap by the tub.) Options here (and elsewhere) are available for individuals, couples, or groups of various sizes. Prague has lots and lots of museums, including the wonderful-sounding Museum of Decorative Arts, the National Museum (which includes the Ethnographic Museum, the Museum of Asian, African, and American Cultures, the Czech Museum of Music, the Antonín Dvořák Museum, the National Gallery, and more), the Mucha Museum, and others. I fully intended to visit a few museums while in Prague. However, that never happened – there was just too much architectural eye-candy right on the street! That leaves lots to see on my next visit. I didn’t get a chance to explore the bit of the Jewish quarter preserved as part of the Jewish Museum either. That was because I forgot to keep track of what day it was. I arrived to tour the site early on our last day in Prague only to discovere it was Saturday and, of course, the Jewish sites were closed. In Prague we stayed at the wonderful Maximilian Hotel. The Maximilian is located in a quiet part of old Prague, but still an easy walk to the historic town square. Inside you’ll find a nice, modern hotel with comfortable rooms and a good breakfast. But what really sets it apart are the super-helpful staff and the extra resources – a basic Czech language lesson, a walking tour to orient you to the area, and lots of helpful advice for planning your days. The Maximilian is not the cheapest option, but it is very reasonably priced for what you get. I highly recommend it. You can book directly with the Maximilian Hotel or check reviews, prices, and book it or one of numerous other hotels in Prague at Expedia, Hotels.com, or TripAdvisor. Booking.com doesn’t seem to offer the Maximilian, but it does have a lot of other properties in Prague. If you are looking for an apartment or just something a little different, Airbnb has many options available in Prague. Just keep an eye on the map to know exactly where the room you are eyeing is located and, if you don’t pack light, remember that most rooms will be on upper levels without an elevator. Prague has a lot of restaurants, but many seem geared to tourists, charging high prices for what can be pretty average food. Still, there are plenty of places to eat. Located along a quiet street in a far corner of the old city, U Cerveneho Kola, offers typical Czech food along with a number of international dishes. It has several dining areas and seems to be a place frequented mostly by locals, rather than tourists. (We found it because it was very near our hotel and the hotel staff recommended it.) The food was very good and the atmosphere pleasant. One day we joined the crowd for lunch at Restaurace Mincovna. It was a good choice. I had the the Czech version of potato gnocchi with goat cheese and bacon. It was absolutely delicious! Super rich and filling, but delicious. Because it is located right off the city square in the heart of Old Town, Restaurace Mincovna attracts tourists who wander in off the square. Still, when we ate at lunch, most other diners were Czech. And, while this is mostly a fine dining restaurant, it clearly is also popular with office workers looking for a nice lunch. Prices were very reasonable and the quality high. Reservations can be made online and are recommended — we were lucky to get in without a wait. Want to pretend you are living in Prague at the height of its elegance, circa 1912? Head over to the Municipal House, an Art Nouveau gem with a concert hall and at least two glorious restaurants. We really wanted to eat in the ultra-luxurious, stunningly gorgeous, and very expensive French Restaurant (Francouzska) – but they don’t serve lunch and we weren’t willing to spring for dinner there. Instead we walked to the other side of the grand entryway to Kavarna Obecni Dum. Described as one of the most beautiful cafés in Prague, this is a huge light-filled space with elaborate Art Nouveau decoration. It was busy, but not packed when we arrived for a late lunch, so we waited for the host to return to the entry. As it was, the “host” ignored us until I forced him to acknowledge us, which he did by basically telling us to go away. But, because it was so beautiful, I took another peek around before leaving. Then, as we started to leave, a waitress ran over and told us to wait and she would find us a table. Soon we were enjoying a pleasant light lunch in a spectacular setting. Once seated, both the service and food were good, if not equal to the setting. Despite the fact that our incredibly rude reception is apparently not uncommon, I’d still recommend stopping in for a bit to eat (either a light lunch or coffee and cake – or both), as it is one of the most beautiful cafés anywhere. I do love ice cream, and I really love the ice cream at I Love Ice Cream. Located at the Al Castello Restaurant, this turned out to be the ideal place to stop on our way to Prague Castle. There is a tram stop right here (for those of us who want to shorten the hike a bit) and the ice cream (and pastries) are absolutely wonderful. Everything is handmade in small batches, so it’s always fresh and delicious. If you need a little chocolate to sustain you as you wander the winding streets of Prague, Gold Pralines has a wonderful assortment of Belgium chocolates, truffles, and other sweet treats. I know what you are thinking. Mexican food in Prague? But by the last night of my three-week trip the weather had turned beastly hot and it was my fourth night in a steamy hotel room with no air conditioning. Out with friends, our only goal was finding somewhere cool where we could eat something other than burgers. I’d walked by Agave many times at the start of my trip, so when we saw they had air conditioning and the day’s special looked good, we decided to try it. (Ok, so maybe it was actually the idea of an ice-cold margarita that drew us through the door, but that was reasonable too.) At any rate, we were not disappointed. Agave serves ultra-modern upscale Mexican cuisine. It’s definitely not the neighborhood taco shop, but you get the sense that this fine dining restaurant may have started there. Everything we tried had an unexpected twist, and all of it was delicious. As were the over-sized margaritas. While it is hard for me to recommend a Mexican restaurant in the Czech Republic, if you are in need of a break from the usual Czech specialties (or the ubiquitous burger joints), head over to Agave for something deliciously different. From Prague, we picked up a rental car and headed south to explore a bit of South Bohemia. With a base in the historic core of Český Krumlov and a rental car, we had the flexibility to explore the surrounding area at our own pace. This is a beautiful region of the Czech Republic, with lots of charming small towns and castles. But, with only two full days to explore, there were lots of places we didn’t get to. If you have a car or bike, it would be easy to spend a full week (or more) just in this part of Czechia. While Cesky Krumlov is often visited as a day trip from Prague, it is a great base for exploring the city and the surrounding region. A surprisingly wide variety of activities, landscapes, towns, and castles are an easy drive away in all directions. And, at the end of the day, you get spend the night in this fairy tale city! While not exactly a hidden gem (it’s a favorite of Rick Steves), Cesky Krumlov oozes charm. There is a grand castle high above the old city, a wide selection of winding cobblestone streets, a river perfect for paddling or floating, and a wealth of fun shops and good restaurants. Krumlov is a tourist dream. Unfortunately, that means tourist groups arrive by the busload. So, for the best experience, stay right in the old town and make the most of early mornings and evenings when the day trippers are elsewhere. That gives you a few precious hours each day to have this gem of a UNESCO World Heritage site almost to yourself! One way to avoid the bus loads of day trippers in Cesky Krumlov is to spend the day visiting other castles in the surrounding area. There are lots of options, including the fairytale Hluboká nad Vltavou chateau and the lakeside Orlík Castle. Both of these castles — and many others — can be toured. Other area castles have fallen to ruin. The medieval streets that wind through the heart of Tábor offer an architectural treasure-trove of elaborately decorated Gothic, Renaissance, and Baroque buildings. It’s a great city for aimless wandering. This South Bohemian city is also an important historical site as a base of the Czech Hussites, with a museum and monuments related to that history. As a bonus, exotic-looking Klokoty Monastery is located right at the edge of the city. Small in size but filled with charm, Telč is a pleasant stop in southwest Moravia. As the best example of Italian Renaissance architecture north of the Alps, the historic center of Telc is a UNESCO World Heritage site. With surrounding fish ponds and lots of color, entering Telc is like stepping into an etching from days long gone. Holašovice Historic Village is a tiny farm town (not a museum or historic park) that retains its traditional layout and architecture. Once common in Bohemia, intact villages of this type are now so rare that Holasovice is a UNESCO World Heritage site. A few similar traditionally decorated buildings can be found as you drive through the countryside, but many outside this one small village are faded and in disrepair. While there are plenty of opportunities for outdoor recreation throughout Czech Bohemia, a veritable hiking and biking paradise lies south and west of Cesky Krumlov. We drove south past Lake Lipno with the idea of spending some time in Šumava National Park, However, the drive was longer than I expected. So, instead of doing both, we just did a little tour around the lake. It wasn’t time wasted though, as the scenery was lovely! This whole area is popular for outdoor recreation of all kinds, with lots of water sports, resorts, and a few fun tourist towns along the lake. Although we didn’t get into Sumava itself, a friend of mine did and had a blast biking and hiking through the rugged landscape. The area is best experienced by staying right there and spending your day actively exploring via foot, bike, or boat. Our base in Cesky Krumlov was a few blocks off the main square at Pension Galko. Pension Galko consists of a few units above a souvenir shop. It’s not fancy, but we had a huge apartment with a kitchen, comfortable furnishings, and big windows with a view over the street. There is no staff at night, but during the day the manager is usually around. Best of all for road trippers, they have reserved parking spots just outside the pedestrianized historic core. The city has a parking fee, so there isn’t truly free parking anywhere in or near the historic city, but knowing there was a convenient parking spot waiting for us when we returned on a busy day was nice. I loved having a view over the city, and Pension Galko is on a relatively quiet street without a lot of loud bars and restaurants. Still, sounds echo in the narrow streets, so nowhere in the old town is truly quiet on weekends. (All it takes is one drunk a few blocks down the street to wake up the whole neighborhood.) Light sleepers might prefer staying outside the center of the historic core or bring ear plugs. There are many, many lodging options in Cesky Krumlov, but the historic core books up long before the busy summer and holidays roll around. Reserve well in advance and expect to pay a premium for a peak-season stay. Check a wide range of lodging options in Kromlov, compare reviews, and reserve your room through TripAdvisor, Booking.com, Hotels.com, or Expedia. Just do it early! As a popular tourist spot that isn’t that big, there are all sorts of interesting Airbnb options available at a variety of prices. Locations outside the historic city may still be very walkable and offer fabulous views. And, if you haven’t used Airbnb before, this link can save you $40 on your first booking. Just be sure to use it right away, because it sometimes seems to vanish if you wait ☹ And, as with hotels here, book early! There is no shortage of places to eat in Cesky Krumlov. Unfortunately, a lot of them seem to serve mediocre food at fairly high prices – although often in great settings! And there are budget options for those looking for something fast and relatively inexpensive. There are a couple nicer restaurants we liked in Cesky Krumlov’s Old Town. I’m sure there are other good ones, but these are a good place to start. Located in a lovely spot along the river, the patio at Papa’s Living Restaurant is a great place to enjoy a leisurely lunch or dinner. They are known for their ribs, which are good, but I’d also recommend the risotto, spaghetti carbonara, and pork fillet! This is one of the higher-end options in Cesky Krumlov. We had a lovely meal of file’ mignon and risotto in a pleasant setting just off the main square. Depending on the weather, dining is available outside on the square or in one of the elaborately painted dining rooms. While it appears the menu at Jakub has changed since we were there, you can expect interesting, well-prepared meals. Note, however, that service here isn’t always equal to the food. We quickly discovered that Czechs aren’t exactly early morning people – finding a café or even a bakery open before 9 am can be very difficult. If you are looking for something before 8 am, it’s basically impossible unless your hotel serves breakfast. Fortunately, the Largo Bistro and Café was just down the street from our apartment. While they are primarily open early (8 am) to serve their own guests, they will provide breakfast to others at a couple of small tables. The breakfast was wonderful, with several delicious options ranging from a selection of perfect pastries to a variety of lovely cooked options. Highly recommended! Between the 17th and 20th centuries, the dukes of Liechtenstein created a sculpted landscape that stretched between and around elaborate castles. Today those carefully manicured grounds, elaborate castle-like manors, gardens, lanes, and monuments are a UNESCO world heritage site. This is also wine country, which offers a whole range of additional activities. The whole area is perfect for exploring by bike. Having a car actually limited our ability to explore more rural areas, as there are many more roads for bikes than cars! Note that there are also a lot of sights to see between Cesky Krumlov and the Lednice-Valtice area. (We wanted to get to Třebíč and Bruno, but there just wasn’t time.) The best way to cover more of the sights here would be to overnight in both Brno and Lednice/Valtice. I had no idea what to expect here and that lack of preparation (compounded by the lack of tourist information either in English or suitable for people with cars) meant we didn’t get to explore the area much beyond the two castles. But those castles are fabulous. At Valtice Chateau we took in an incredible exhibit on the Silk Road. On the other hand, we mostly wandered the formal gardens around fairytale-worthy Lednice Castle. Both have a lot more to offer, including a variety of interior tours, more gardens than we saw, and the National Wine Cellar at Valtice. It would be easy to spend a few days relaxing here. A last-minute booking put us in the Penzion Prinz in Valtice, an older property with elegant rooms located less than a block from Valtice Chateau. Our room was charming and comfortable, with secure parking in back. It was also very convenient for visiting the Chateau. They also served a lovely breakfast. They even offer a special package for seniors. The only thing more convenient would have been a room IN the chateau. That’s usually possible (although not cheap), as the Hotel Hubertus is located in a wing of the chateau. However, the hotel will be closed through 2020 for roof and façade reconstruction. So, if you want to stay in a castle before the Hubertus reopens, you’ll have to venture over to Lednice. There, the Hotel Lednice houses guests on the castle grounds in a building used for that purpose since the days when the royal family was here. Actually, there are a good number of options in Lednice, and the town itself is quite charming, making this a great place to stay while in the area. You can see what your options are in both Valtice and Lednice, check reviews, compare prices, and reserve your room through TripAdvisor, Booking.com, Hotels.com, or Expedia. There are also a variety of options available on Airbnb. As always, if you haven’t tried Airbnb, this link can save you $40 on your first booking. It was almost sunset when we arrived in Valtice and I didn’t feel like a big dinner. Instead, we had some granola bars and then walked over to Milan Hradil for a wine tasting. This atmospheric little wine shop is tucked into the castle gate and offers an impressive selection of wonderful Czech wines. The proprietor is knowledgeable and patient, so you can learn a lot about Czech wines as you sample them. Vienna served as the home base of the Habsburgs for over 600 years as they ruled Austria and, for a time, a large portion of Europe. As one of the most powerful and long-lived dynasties in Europe, they had the time and the means to build a city equal to their political ambition. While I knew all this, and knew of Vienna’s reputation for style and elegance, I just didn’t understand the scale of it all. Even having been there, it’s still hard to grasp. Vienna is huge and it has enormous buildings filled with collections of unbelievably rare and valuable objects. It’s amazing, but also rather overwhelming. And a few days is hardly enough to even scratch the surface of it. Being that it was summer, I had my heart set on wandering through a lot of palace gardens. However, we hadn’t really done any museums yet on this trip (and we both love museums), so my husband steered me toward palace collections and museums instead. But there were so many choices! Which palaces? Sprawling Schönbrunn with room after room of riches? Hofburg, with three museums that provide a glimpse of royal life? Belvedere with its grand gardens and art collection? And which of Vienna’s more than 100 museums should make our list? Hofburg palace was the administrative center and home base of the Habsburgs during their long rule over Austria and beyond. The complex expanded over the centuries along with the Habsburg’s power. What began as a medieval castle in 1275 is now a palatial complex with over 2500 rooms and almost 20 courtyards. A variety of tours take visitors into the royal apartments. We took the “Sisi” tour, which focuses on the life of Empress Elisabeth, a beloved but troubled woman murdered in 1898 at age 60. The ticket also included entrance to the Imperial Silver Collection. Seeing as this is basically a museum of royal china, glassware, and hollow ware, it seemed like a nothing add-on that turned out to be much more interesting – and much, much larger – than one would expect. I’ve always wanted to visit the Spanish Riding School to see the Lipizzaner horses perform. While this is located at Hofburg, the horses get the summer off, so that remains on the list for a future visit. We didn’t get inside any of the other palaces. We looked at the exterior of Schönbrunn Palace and spent a half-hour or so in the gardens before they closed for the day. Likewise, we didn’t go into either the palace or Orangery museum at Belvedere, but I did get to take a peek at the palace’s splendid gardens. With over a hundred museums, there are lots of options in Vienna. We tend to be most interested in historical items, fine craft, and functional art rather than fine art, so that’s how we spent most of our museum time in Vienna. All three of the museums listed below were fabulous. The Imperial Treasury (Schatzkammer) displays some of the rarest and most valuable items collected by the Habsburgs over the centuries. The items themselves go back even earlier in time, with relics from a thousand years ago and more. Of course, there are also scores of ceremonial robes, crowns, scepters, jewels, weaving, and more. The Imperial Treasury is located in a portion of the Hofburg complex. The Welt (World) Museum is also located in a portion of the Hofburg complex, the Neue Burg (New Castle). This is an archaeological/ethnographic museum with amazing pieces from across the world: Think sculpture from Benin, Central and South American pottery and feather headdresses, Chinese court robes, pattern books for Japanese masks, Indonesian carvings, and much more. There are even fragments of a pre-colonial Mesoamerican codex, one of only a dozen or so to have escaped destruction by Spanish priests accompanying the Conquistadors. Its collection is different, but every bit as impressive as the Imperial Treasury collection. The Museum of Applied Arts (MAK) is a wonderful mix of things. While it’s easy to think of it as a museum of functional art, it goes beyond that. It’s really a general design museum. When I visited there was lots of pottery and furniture on display, but there was a lot more than that, and few displays were traditional museum exhibits. My favorite exhibit at MAK was a huge architecture/urban planning show called Post-Otto Wagner: From the Postal Savings Bank to Post-Modernism. That may sound as dry as the museum description I just linked to, but with maps, models, drawings, photos, video, furniture, and various installations, it not only showed the path our built spaces followed over the past 100-plus years, but also some mind-blowing paths not taken. Unfortunately, we needed about three days just for this exhibit (let alone the rest of the museum). In the end, the exhibit was so interesting I actually shelled out the cash to buy and haul the very large exhibit catalog home for a more leisurely review. At Saint Stephan’s Cathedral (Stephansdom) I paid for the photo pass in order to wander freely inside. I also went up to the top of the North Tower (the shorter tower) to take in the view. Saint Peter’s Catholic Church is stunning, but we were a little overwhelmed by golden Baroque gaudiness. We stepped into Saint Michael’s Church just far enough to take in the Rococo angels and a few other “modern” additions to this very old church. A number of companies offer bicycle taxi tours via pedicabs, rickshaws, and tricycles. While not inexpensive (the price varies with demand), it’s a fun way to get a quick overview of Vienna’s highlights, and tours can be customized to some extent. Drivers can be found looking for passengers in most tourist areas – just interview them for price and language skills before making your selection. Vienna isn’t an ideal place to have a car. (It’s a horrible city to drive in.) Thus my hotel search focused on something affordable in an interesting neighborhood with good transit connections and off-street parking. I actually found all of that at the Austria Classic Hotel Wien. Not only did it meet those basic functionality requirements, but the Austria Classic Hotel Wien turned out to be a historic charmer that offered great service and a bit of style along with a good location and off-street parking! It’s actually served as a hotel since 1838 and, with the exception of a brief period, it’s remained in the same family for all that time. Having undergone various updates over the years, the hotel has aged pretty well. Hotels aren’t cheap in Vienna, and this was a good value for the money. The Austria Classic Hotel Wien can be booked directly or you can check reviews, compare prices, and reserve a room here or at any of scores of other hotels in Vienna through TripAdvisor, Booking.com, Hotels.com, or Expedia. There are also a variety of options available throughout Vienna on Airbnb. And, as always, if you haven’t tried Airbnb, this link can save you $40 on your first booking. Vienna has a wide range of restaurants of varying quality. With the exception of oh-so-trendy DO&CO, we generally looked for places that were supposed to be good, but were also near wherever we happened to be. The one foodie destination on my itinerary was the restaurant at the top of the DO & CO hotel. Or more precisely, the terrace at the top of DO & CO. Located on Stephsplatz, this trendy fine dining restaurant has both great food and spectacular views. Located near our hotel, we ate at Fiorino mostly because it was convenient. However, this rather casual and affordable pizza, pasta, and ribs spot surprised us with very good food for a reasonable price. I had the pasta carbonara and my husband had linguine with chanterelles. Both dishes were well prepared and tasty. And, looking around the room, the pizza and ribs are also very good. This is a good family-friendly option for anyone who finds themselves in Vienna’s Leopoldstadt neighborhood. As you may have guessed from the name, fusion is the name of the game at Mercado Nikkei. While Peruvian-Japanese food sounded strange at first, it’s really not that odd. Peru has a sizable Japanese population that goes back to end of the 19th century. Why wouldn’t Japanese techniques have been adapted to Peruvian ingredients and flavors after all those generations!? We feasted on small plates of short ribs, salmon nigiri, classic ceviche, lomo (beef) empanadas, and chicken anticuchos (skewers). And, of course, I also had a couple of killer Pisco sours. While I often have only a limited idea of what to expect when I travel to a new place, that was especially true in Slovakia. Tourist information in English generally only goes as far as Bratislava, which is about an hour out of Vienna. Beyond that, it’s more difficult to find accurate information. Fortunately, there is more travel information available online all the time, so travel here should get easier for those of us who find the language a mystery. What I found as we drove through the countryside was not so different from the Czech Republic. There are more castles, more traditional architecture, and wilder mountains – but fewer people. The sights may be more low-key than more familiar places in Europe, but Slovakia is a great destination. And it isn’t undiscovered. We found big crowds at all the parks, castles, and other major historic sights we visited (or tried to visit) as we traveled through on a summer weekend. While English-speakers may be unaware of Slovakia’s charms, plenty of others are in on the secret. Our sightseeing in Slovakia was largely limited to what was along the way as we drove through the country, although I chose our route to hit as many sights as I could without traveling too far out of the way. When I first started planning this trip, I thought we would spend a night in Bratislava because Julie Callahan who writes at the World in Between made it sound like the perfect spot for us on an episode of the Amateur Traveler. But by the time we left Vienna, I was ready to head for the hills again and even Bratislava seemed too big. But Bratislava Castle sits on a hill far above the city, so we made a brief stop there to walk around the castle grounds, admire the view, and enjoy a lovely dessert and a glass of one of the best fruit lemonades I’ve ever had. As we drove away from the city I had second thoughts about skipping it. But I had long list of other things I wanted to see while we were in Slovakia, so off we went. Instead of spending our one night in Slovakia in Bratislava or at a mountain resort, we ended up in Banská Bystrica. With a large historic core that absolutely oozes charm, this was the perfect place for us. I couldn’t believe how perfect it all seemed as the setting sun illuminated the historic buildings and monuments along the city’s central square. It would have been nice to have more time to explore here. The tiny mountain village of Vlkolínec is a UNESCO World Heritage site because it is a relatively intact example of the log settlements once common in the mountains of Slovakia. Today the village is a mix of private residences, vacation rentals, and tourist businesses. But it is still easy to get a sense of what life was like here generations ago. And it is very fun to photograph – even in the rain on a busy summer weekend! I’ve long been fascinated with the wooden churches of Scandinavia and Russia, so imagine my delight when I discovered that Slovakia also has wooden churches. We stayed at the Urpín City Residence in Banská Bystrica, a lovely historic town in the middle of Slovakia. We chose Banska Bystrica mostly because it was located near the half-way point of our route though the country. As it turned out, Banska Bystrica was a great choice for us. Even staying for only an evening gave us time to wander much of the town’s lovely historic core and enjoy a tasty meal in one of the excellent restaurants. There was a lot to see and it turns out that this is a popular spot for tourists from the region. And the Urpin City Residence was also a good choice – especially at the last minute on summer weekend. It wasn’t a bargain, but we got a big, clean room just a block off the central square. There was no AC, but fans and the huge windows cooled the room pretty well. The hotel in general, and our room in particular, had a retro vibe with features that haven’t been altered since the building was built – probably in the 1960s. So, while a few things really needed updating, in general the ambiance was worth a few less-than-modern bathroom fixtures. And did I mention that the room was huge? With a kitchen? You can book the Urpin City Residence online through the hotel website above or check reviews, compare prices, and reserve a room here or at any of the other hotels in Banska Bystrica through TripAdvisor, Booking.com, Hotels.com, or Expedia. There are also a least a few places available in and around Banska Bystrica through Airbnb. As always, if you haven’t tried Airbnb, this link can save you $40 on your first booking. Note that the kind woman who manages the Urpin City Residence has rather limited English. However, she will do her best to give you directions to help you find suitable activities and dining options. We had an absolutely lovely dinner of tagliatelle and risotto just off the plaza at Bernardov Dvor in Banska Bystrica. This is probably the best restaurant in town and our food was absolutely delicious. Krakow, Poland, is filled with fantastic architecture. You like Gothic? Krakow has lots of it. How about Baroque? They have that too. Art Nouveau? Yup. There are few older styles too. (They even have Communist modernist, if that’s your thing, but you have to leave the historic city center for that.) All of this architecture is a big part of the reason Krakow’s historic center (the medieval cities of Krakow and Kazimierz along with Wawel Hill) hold a UNESCO World Heritage designation. With all this architecture to behold, I spent most of my time gawking at buildings in historic Krakow and Wawel castle. So much time that I didn’t see hardly any of Kazimierz. That was unfortunate, as the area was home to Krakow’s Jewish community and has interesting historic, architectural, and cultural sights. Krakow’s Market Square is now tourist central. And why not? This is an old crossroads that has long been at the heart of the city. The square is also beautiful to behold, with the Renaissance Cloth Hall and Town Hall Tower and Romanesque Church of Saint Adalbert. It’s also surrounded by historic townhouses of various styles (although most of those were built in the last few hundred years) and overseen by the Gothic towers of Saint Mary’s Basilica. And, with outdoor cafes everywhere, it’s great place just to hang out even if you don’t care about architecture at all! Our excellent Architecture and Gardens tour took us to some interesting areas not otherwise open to the public. It also included a pass to climb the tower. Each day one of the main exhibitions is available for free. The day we visited, the free exhibition was the Crown Treasury and Armory. Both were mildly interesting. The Armory was more interesting than I’d anticipated, with swords and helmets that were true works of art. Still, it’s hard to compete with the goodies the Habsburgs squirreled away in the Treasury in Vienna! Of course, we also took in centuries of architectural and political history in Wawel Cathedral. The Basilica of Saint Francis of Assisi is another medieval church with stunning Art Nouveau embellishments. It’s gorgeous and much less crowded than Saint Mary’s! Dating to the end of the 11th century, the Church of Saint Andrew and Covent of the Poor Clares is among the oldest in Krakow. The Church of Saints Peter and Paul has an ornate early 17th century Baroque exterior. The interior is far simpler. Krakow’s oldest church, the 11th century Church of St. Adalbert, sits right in Market Square. It’s that tiny little white church that often has evening concerts. Krakow is a place where you can find really nice places to stay without spending a ton of money. That’s especially true outside the old walled city. We stayed a couple blocks outside the Planty (the greenspace that marks the location of the original city wall) on the northwest side of the city. The neighborhood was a mix of historic buildings and some more contemporary infill with a lot of renovation underway. The large number of foreign language schools and budget shops seemed to indicate there were a lot of students and lower-income folks in the area. But we found a gorgeous Airbnb there that was safe, cheap, and had a parking garage. All just short walk from the heart of Old Town. The neighborhood itself was safe and convenient. It’s not among the neighborhoods I’ve seen listed as a good spot to stay, but I’d recommend it. I’d particularly recommend the place where we stayed. The large, airy apartment had lots of light and furnishings that were tasteful, functional, and comfortable. There was also an elevator and a parking garage. It would have been nice to move in and stay for a few weeks! Check Airbnb for this unit and many, many others available throughout the city at a wide range of prices. And, as always, if you’ve not used Airbnb before, save up to $40 by using this link to create an account and book you first stay. If you can’t find an Airbnb that suits you or simply prefer having some services available, there are lots of hotel options in Krakow. And, as with Airbnb, your money tends to go a lot farther here than in many other spots in Europe – so it might be the place to splurge a bit! For the best hotel deals in Krakow, check reviews, compare prices, and reserve a room through TripAdvisor, Booking.com, Hotels.com, or Expedia. Food-wise, Krakow was my favorite city on our Central Europe Itinerary. There were tons of options and quality was generally high while prices were low. We found the both the best food and prices along the streets just off the Market Square. However, even places right along the square had decent food at prices that weren’t too high – after all you have to pay for the view! Lunch at Fiorentina was a gourmet Italian-inspired experience. Our meal was innovative, beautiful, and absolutely delicious. And, our table was located so we actually got to watch the chef put it all together! Our starters included a salad sealed in a clear wonton, which I ordered because I had no idea from the description what to expect and was pleasantly surprised by both the presentation and the flavors. That was followed by simple, perfectly grilled lamb (for my spouse) and a lovely ravioli. The menu changes seasonally, but based on our lunch, you won’t go wrong here in any season. Our other amazing lunch in Krakow was at Sant’Antioco, an Italian restaurant featuring Sardinian and Mediterranean dishes. It’s off the main square a bit and for some reason we had a hard time finding it. (Google kept steering us the wrong direction.) But I’m so glad we didn’t give up! We stuck with the Sardinian specialties and couldn’t have been happier with our choices. My husband had the delicious Sardinian gnocchi with flavorful beef ragu, mushrooms, and Pecorino. That was great, but my dish was absolutely amazing. I ordered the Sardinian black ravioli (stuffed with white fish) and served with seafood and tomato sauce. I was expecting a plate of pasta with some seafood, but the dish I got went way, way beyond those expectations. The large slabs of perfect ravioli were covered with enough shellfish to serve as a meal on its own. It’s one of the most impressive (and delicious) dishes I’ve had anywhere. This year’s 2018 European TBEX conference (Travel Blogger’s Exchange) was held in Ostrava, a former industrial center about four hours east of Prague in northeastern Czechia. This was my fifth TBEX conference, having previously attended in Keystone Colorado, Toronto, Minneapolis, and Stockholm. Like most conferences, TBEX includes presentations, workshops, networking events, and parties. I try to attend every few years when it is in a location I’d like to visit – and the Czech Republic certainly fit the bill. TBEX conference sessions were held at the GONG conference center in Ostrava. The GONG is in Dolni Vitkoice, a former industrial site that included everything needed to produce steel – a coal mine, iron smelter, rails to ship raw material in and the finished steel out, etc. Today the site is an industrial monument and event center, with museums, tours, a café, and the GONG. It’s a cool place with a slightly surreal abandoned industrial vibe. The GONG is a state-of-the-art conference center created from an enormous gas storage tank. It’s a great example of creative reuse on a really large scale. And a great place to spend a few days in meetings and seminars. It was a cool site. And worth a lot more exploration time than I was able to give it. I stayed at the Clarion Congress Hotel in Ostrava because it looked nice, was one of the conference hotels, and appeared to be a good base for getting to and from the conference. It was a nice hotel, but there were few conference attendees staying there and it wasn’t great for getting to and from conference events. The Clarion Congress is a standard international hotel with large air-conditioned rooms, an excellent front desk staff who cheerfully provided directions (sometimes repeatedly) and made reservations for me, and a surprisingly good in-house restaurant. The Clarion Congress isn’t the cheapest option even in this part of Ostrava, but it is an easy and comfortable choice for visitors who will either be using their own car or attending events at the sports facilities that are within walking distance. It’s not convenient if you aren’t Czech and plan to spend time in the central city. You can book the Clarion Congress directly from their website, or consult TripAdvisor, Booking.com, Hotels.com, or Expedia to check reviews, compare prices, and reserve a room here or at one of the many other hotels in Ostrava. Airbnb is another option in Ostrava, where a number of listings are available throughout the city. But read the transportation information below before you book to be sure you will be able to get where you want to go in the city with a minimum amount of hassle. And, as always, if you’ve never tried Airbnb before, save up to $40 by using this link to create an account and book your first stay. Ostrava was one of the more difficult cities I’ve had to navigate. And technology was a big part of the problem. Geography complicates things, as this is a large city with a rather irregular layout. Driving in Ostrava is further complicated by a road system designed to serve Soviet-era industry rather than the local population. That means lots of backtracking to get anywhere. Instead of driving, visitors are best off if they rely on the transit system or ride-share companies. However, and this is a big however, Americans (and many other visitors) need to stay in the city center if they plan to rely on transit. This is because tickets outside the city center are only available on the train and only by using a special technology-enhanced credit/debit card that isn’t common even with many European cards, let alone American cards. Without it, you cannot buy a ticket. You read that right. It is impossible to purchase a train ticket at a station outside the city center without an unusual type of credit card (you cannot use cash), but you are required to have a ticket to board at those stations. And it is enforced. The other issue I had was that some of the train stations near my hotel required walking through unlit, seemingly abandoned areas. While I am pretty sure the local residents were right to say it was perfectly safe, it didn’t feel that way. Compounding this problem for me was the (temporary) problem that the train station closest to my hotel was closed for construction part of the time I was there. On top of all this, I found the transit maps difficult to use, as they didn’t clearly show where transit routes coming into the city center connected with routes that only served the city center. I was never able to make a connection from my train to the bus or train I needed in the city core. Instead I ended up walking blocks and blocks through seemingly abandoned areas of the city before arriving late at my destination. I wish I had just stayed downtown where it was easy to purchase train tickets instead of staying near the conference site. As it was, I skipped several events in the city because it was just too much of a hassle to get there. But if you stay in the historic core of the city or near it, you’ll be fine. Or try one of the area’s ride-share companies. Most of my meals were either at the conference or at my hotel. But even so, the quality was pretty high – even at the conference where the meals were mass-produced. Fortunately, the Clarion Congress Hotel has a very nice full-service international restaurant. I ate several meals at the fine-dining restaurant and all of them were excellent. The breakfast buffet is also impressive, with an amazing number of options. While the regular restaurant served standard European dishes with a lot of Italian and Czech options, the humongous breakfast buffet offered an unusually large range of both international and local choices. I met friends for dinner in the city center at Hogo Fogo Bistro. This is a trendy bar/restaurant with a limited menu that changes regularly. We ordered seafood salads and were pleasantly surprised to be served a salad where fresh seafood really was the star. The food was excellent and service was fine once we were seated, but this is a snotty place. We had a reservation, otherwise I don’t think they would have seated us, even with plenty of open tables. It could be that we didn’t match their customer profile (too old, not beautiful enough) or just that the staff was hoping to get out of there super early. Either way, it created a really negative vibe. Make a reservation if you want to eat here and force them to acknowledge you when you arrive. Although I can only find one listed on the web, it seemed like there were two cafés in the Bolt Tower in Ostrava’s Dolni Vitkoice. One (where I had a soda) was a really basic coffee shop with almost no seating. The other appears to have both more seating and more menu options, including some really lovely-looking desserts. (Maybe I was just feeling the need for a great dessert or some other treat!) There is a charge to go up in the tower, but that includes a small credit for the café, so you might as well stop and have a coffee or something. And, while I can’t vouch for the food, it would be a great spot just to sit for a bit. Ask – or make a reservation – before you go up to make sure you get a spot. I spent the day before the conference on a tour that let me see a bit more of the Moravian-Silesian region around Ostrava. As guests of the regional tourism agency, we were given a quick look at what this relatively untouristed part of the Czech Republic has to offer. It was a day trip with a variety of sites. The itinerary and most of the costs associated with this day trip were covered by our regional hosts. However, all information and opinions are strictly my own. Our first stop was Opava, a city right along the border with Poland. Opava lost a portion of its historic core during World War II (and too much of what remained was demolished in the following years), however, it’s still a very pleasant spot. While in Opava we also got to climb the Hlaska tower at the city hall. The tower is an interesting structure and provides fine views of the city all around. Just outside Opava, we got to tour the Panský Mlýn (Manorial Mill) microbrewery. The guide was knowledgeable and did a great job of explaining their brewing process. Of course, we ended the tour with samples of their three great beers: Brown Bear, Grizzly, and Kodiak amber. I usually favor darker beers and both the Grizzly and the Kodiak were really, really good. But even the light Brown Bear was pretty good! The brewery is part of a larger complex that includes a restaurant and lodging. The original medieval castle at Raduň was turned into a Renaissance chateau in the 16th century. And then it was rebuilt again in the 19th century. Further modifications occurred over the following decades as the chateau served as a family summer home until the end of World War II. The castle today retains bits of that long history in its architectural features. Inside, it is generally decorated and furnished to evoke the lives of the castle’s late 19th and early 20th century residents. Radun castle is open as a museum. The interior can be seen as part of an informative guided tour. As a guest of the Zlín and Luhačovice tourism offices in East Moravia and Czech Tourism, I was part of a small group on a fully-guided familiarization tour highlighting a bit of this beautiful and interesting part of the Czech Republic. There were six of us in our group, four travel writers/bloggers, a member of the Czech Tourism staff from Prague (she was learning more about the area along with us as well as helping manage the tour), and our extremely patient local hosts/guides/coordinators from Zlin and Luhacovice. Along the way we also enjoyed the services of local guides, business owners, and a couple of drivers. It was a fascinating and exhausting tour with a packed schedule during an unrelenting heat wave. Our tour was called “Bata’s Region.” I selected it because it offered a nice mix of historical sites (including a UNESCO World Heritage site), gardens, and architecture. But mostly because it promised a bit of urban planning history and the Bata shoe collection. We all have our priorities. The tour delivered all that and more. Except for a bit of wandering around Kromeriz, all of my time in East Moravia was a fully-guided group tour. The itinerary and virtually all costs associated with my travel was covered by our regional hosts. However, all information and opinions presented here are strictly my own. Our tour began in Zlin, the region’s largest city, and continued on to the beautiful city of Kromeriz before ending in the spa town of Luhacovice. We toured some of the most significant sites in these cities (but nowhere near all the sights) and made a few stops in smaller places along the way. It was enough time to see a few highlights, but there is still a lot more to explore. While he’s probably best known today as an innovative shoemaker and industrialist, Tomas Bata was an innovator in many areas – including urban planning. And Zlin is the best place to begin to understand the varied aspects of Bata’s life and work. Our tour included a far-too-short visit to the Museum of Southeast Moravia. Located in part of the former Bata shoe factory, the museum’s exhibition is called The Bata Principle: fantasy today, reality tomorrow. This fascinating exhibit includes the Bata collection of historic shoes (lots of shoes, but not as many as at the Bata Shoe Museum in Toronto, Canada) and shoemaking equipment. But it also includes exhibits on Bata’s life and innovations, as well as on filmmaking in Zlin (largely children’s films and Claymation) and travel in the modern era. (All of these have at least a tenuous link to Bata.) It would have been easy to spend an entire day exploring the intriguing and thoughtfully presented exhibits. We also visited the Bata “skyscraper.” A skyscraper only by the standards of 1930s Europe (it’s 16 stories), Bata’s former headquarters in Building 21 is filled with innovations. Most unusual among them is Bata’s office in an elevator, which we got to ride in. It takes efficiency to a particularly high level. We also saw how Bata shaped Zlin’s urban form not only to support industrial efficiency (think aerial lifts to move material between buildings at the level where they were needed) but also in alignment his beliefs about what led to a happy and productive workforce. This went beyond employee housing, schools, hospital, and theater, to include things like restaurants so there was no need to worry about getting a meal on the table every day! There are a few other Bata cities (most notably in Canada), but this is where his ideas were most fully implemented. And, before leaving Zlin, I got to buy a pair of shoes (on sale) in the Bata store. All in all, our dive into Bata’s world was everything I had hoped for and more. I’m not terribly interested in medical tourism in general or fertility treatment in particular. However, it was interesting to see how the Clinic of Reproductive Medicine and Gynecology in Zlín was set-up. The facility not only offers a full-range of state-of-the-art treatments, but also lodging, meals, and spa services to help its patients through the medical procedures. For those who wish to purchase the whole package, it’s a treatment model that addresses the whole person. It’s a different way of thinking about medical care and what really matters. And it offers quality care that is a lot more affordable than in the USA. I’m not a big brandy drinker and a visit to R Jelinek Distillery Land didn’t turn me into one. But the tour was a fascinating mix of distilling know-how and Czech history as explained by Jelinek’s dynamic owner. It was an interesting tour through a facility that was designed specifically for that. And the apricot brandy wasn’t bad either. The small town of Holešov attracts tourists to two very different sites: A Baroque chateau and the remains of the Jewish community that once thrived here. Holesov chateau is best known for its observatory, which we didn’t visit. However, it is also famous for its expansive and carefully engineered French gardens, which we did visit. Apparently, the observatory and reading room are the only part of the chateau that are furnished. However, the building itself is said to have lovely architectural embellishments and paintings on the walls and ceilings. It certainly looked enticing from the outside! Before World War II, Holesov had a large Jewish community. Today a few buildings are about all that remain of that community. But those buildings include the well-preserved 16th century Old Synagogue (The Sach Synagogue) and large cemetery with the tomb of Rabbi Shabbatai ben Meir HaKohen (Rabbi Sach), a highly respected scholar of Talmudic law. Today the synagogue is a moving museum and historical monument to the community that once surrounded it. At the same time, it remains an active pilgrimage site for Jewish people from around the world. Kroměříž may be the most charming town in the region. As the summer home of the Olomouc archbishops, the city was the focus of regional power and wealth for generations. That history is evident today in its many grand buildings. And it’s particularly evident in the Baroque Archbishop’s chateau and gardens, a UNESCO World Heritage site in the heart of the historic city. Our guided tour took us through most of the chateau. The building is fully furnished to reflect the lives of the bishops and archbishops who lived there, including the valuable collection of paintings they assembled to adorn the chateau’s walls. It includes the public and private spaces one would expect in a building of this pedigree, but also rooms specific to the needs of its ecclesiastical residents. These include spaces dedicated to administering church business and dispensing justice. There is also an incredible library filled with rare volumes and giant globes and a music library with antique instruments and scores. Walking through the palace (that’s really what it is) I’m continually reminded that the princes of the church were every bit as wealthy and powerful as their secular brethren – perhaps more so. The garden immediately behind the chateau has undergone many changes, going from a Renaissance kitchen garden with ornamental features and a game reserve through various styles (a little Baroque, a bit of Rococo) to become a Romantic garden with sweeping lawns and wooded glens with ancient-looking garden follies. That is largely the state it remains in today, with features from all eras found in various spots. This landscape covers a fairly large area and we visited on a very hot day. Fortunately, our host commandeered one of the trolleys that prowl the grounds for us. While the garden is not actually as large as it appears at first glance, the trolley tour is a great way to get an overview of the garden along with historical and horticultural information. And, on a hot day with limited time for touring, it’s a godsend. But one must travel to the edge of Kromeriz to see the chateau’s most beautiful garden, the Baroque flower garden. Constructed in the second half of the 17th century, this is one of the few gardens of this style remaining in Europe. Even under the harsh light of the mid-day sun, it’s a stunning garden. To be honest, I’ve always thought of spas as pretty boring. I’ve never understood why anyone would want to spend any more time at a spa then necessary. And then we visited Luhacovice. Luhacovice is beautiful, relaxing, and interesting! I could easily see myself spending part of the day taking a spa treatment or floating in a pool and part of the day window shopping, eating, and exploring this fun little town and the lovely parks and natural areas in and around it. And the architecture! While there has been some unfortunate infill, it’s easy to see the influence of Dusan Jurkovic in the distinctive architecture that mixes Slavic folk designs and Art Nouveau with a bit of English arts and crafts. It’s a wonderful setting whether you are partaking of a spa treatment or just exploring the town and enjoying the surrounding natural area. When I visited, traditional culture lived on at the Luhacovice Museum through an exhibit celebrating Czech history using modern recreations of intricately detailed folk clothing and accessories. We visited the exhibit with the curator, which was a real treat. It was textile nerd heaven, but there was a little something for everyone! It appears that the latest exhibit focuses on the development of Luhacovice as a spa town, with an emphasis on the work of Dusan Jurkovic. (Another exhibit I would geek out on.) In addition, the permanent exhibitions seem to cover a broad range of local history and culture. Traveling at the peak of Czechia’s summer tourist season likely made it tough for our hosts to arrange lodging. And an unusually hot summer made rooms without air conditioning miserable. Neither of those factors were under the control of our Czech hosts, but they did make it hard to fully appreciate lodgings that – in other circumstances – would have been viewed very positively. The Hotel Tomášov is part of a facility built by Tomas Bata as a hospital. Part of it still serves as a medical facility, housing the Clinic of Reproductive Medicine and Gynecology. But you’d never guess it’s connected to a medical facility from the luxuriously appointed modern hotel rooms. Hotel Tomasov is located in the hills above Zlin, making it a quiet and private place to stay, but putting it a good distance from city center restaurants and shops. You can book a room at the Hotel Tomasov or check reviews, prices, and make a booking at any hotel in Zlin through TripAdvisor or Booking.com. If you want to stay in a Bata house, check Airbnb, where several options are available. Hotel La Fresca is a historic building right on the beautiful city square in Kromeriz. It’s a friendly, old-fashioned charmer where you feel as if you may have stepped into a more gentle, relaxed era. My room on the front of the building had big windows over the square and lots of places to spread out around the room. The one thing it didn’t have was air conditioning. The rooms on the back of the building did have AC, but – as hideously hot as it was – I wasn’t willing to trade my view for a bit of cool air. And there was a fan. It’s a perfect location in a lovely, comfortable old building, although it was hard to get to sleep with Kromeriz’s gorgeous city square just beyond the window! You can book Hotel La Fresca at the hotel’s website or check reviews, prices, and book a room through TripAdvisor, Booking.com, Hotels.com, or Expedia. Our host in Luhačovice admitted that finding rooms on relatively short notice during the peak summer season was almost impossible. The hotel we ended up at wasn’t bad, it just wasn’t well suited to my needs or the very hot weather we were experiencing. It’s a good reminder to book a peak season rooms well in advance. Luhacovice gets very busy during the summer. Or visit in the off-season when prices drop, but spas and other activities are still available. Check TripAdvisor, Booking.com, Hotels.com, or Expedia to read reviews, check prices, and book a hotel in or around Luhacovice. We spent our last night back in Prague at the Hotel Casa Marcello, a large historic building very, very near where I stayed when I first got to Prague. How much one likes the Case Marcello probably depends on where your room is located, as this hotel (in a building dating to the 13th century) offers a very wide variety of rooms. My room was on the main floor along a busy courtyard, so leaving the windows open at night wasn’t really an option. And, of course, I didn’t have air conditioning. (Another member of our party had an upper level room with air conditioning, so some rooms have it.) I would have been very happy in my huge, slightly faded, old-fashioned room even without AC – if only it had been up a level so I could open the curtains and windows! The hotel has at least two courtyards (the hotel really does ramble all over the place, so there may be other courtyards I didn’t discover) and a pleasant breakfast room. We had a private breakfast in a courtyard just for TBEX participants (most of the tours stayed here on their final night), and the food was absolutely amazing – both beautiful and delicious. The staff was very helpful and friendly, even with an onslaught of folks coming in all at once. Did I like it as much as I liked the Maximilian, where I started my trip? No. But Casa Marcello has a lot more character and I suspect it was a lot cheaper than the Maximilian. It’s in the same great neighborhood and an upper level room at Hotel Casa Marcello seems like it would be a good value with or without AC. And the building is great. You can book the Hotel Casa Marcello through their website or through TripAdvisor, Booking.com, Hotels.com, or Expedia. Food may be what most surprised me in the Czech Republic, both in East Moravia and around the rest of the county. I was anticipating heavy meals with dull flavors or poor renditions of international dishes. Instead I discovered that even the smallest towns had restaurants using fresh local ingredients as the base for flavorful contemporary renditions of both Czech and international classics. In other words, absolutely delicious the food was available throughout the Czech Republic. And the beer was every bit as good as I expected! We stopped for lunch at Koliba u Černého medvěda (Black Bear Tavern) in the wooded hills outside Zlin. The restaurant is part of small woodsy complex that offers lodging as well. With a large patio and hiking trails through the woods, the Black Bear Chalet looked like a great spot to spend a few days and eat a few more meals! We ate both dinner and breakfast in Zlin on the pretty patio outside the restaurant at Hotel Tomasov. The hotel’s fine-dining restaurant served lovely and delicious dinners – my salmon couldn’t have been prepared better. While most diners are probably hotel guests, it is worth the short drive up from the central city to eat here if you aren’t staying at the hotel. Before leaving Zlin we stopped for lunch at La Farfalla Mediterranean Restaurant. We started off a round of flavored lemonades. I went with the lavender. It was amazing. Our first course was a flavorful tomato soup. I’m fussy about tomato soup and usually avoid it. However, this was among the best I’ve had, with just the right amount of basil and other seasonings to play off the thick, rich tomato base. I was also nervous about ordering the day’s seared tuna lunch special. (Zlin is nowhere near the sea, which generally makes avoiding seafood a good idea.) However, our host had bragged that his son was the restaurant’s seafood chef. How could I not order the seafood special knowing that?!? Our host was right to brag. The seafood chef knew EXACTLY what he was doing. When you get to Zlin, eat here. If you have to make a special trip to Zlin in order to eat here, do it. Really, it’s that good. In Kromeriz we ate both dinner and breakfast on the beautiful patio overlooking the city square at Hotel La Fresca. My dinner was very nice, with a salad and beautiful risotto. Breakfast was great, with a buffet of meats, cheese, pastry, and more. We’d been eagerly awaiting lunch all morning because we knew that Cerny Orel is also a brewery. The beers did not disappoint – they were fabulous. Even the yellow ones! And the quick lesson on brewing was great. The owner is clearly passionate about beer and how to make beer. It was fascinating to hear him explain how beer should be made (unfiltered and unpasteurized in the classic Czech style) and why. And I loved the tour of the chocolate shop and factory Yesterka, where all the chocolate is made by hand. Here we got an interesting lesson in chocolate-making and all the samples we wanted (it was a hot day and chocolate doesn’t keep well in the heat). The chocolate was both beautiful and delicious. Unfortunately, our lunch wasn’t so great. It started off great, with a delicious Czech version of chicken spätzle soup. The vegetarian in our group traded for a traditional Czech bar snack with some sort of very strong roasted cheese wrapped in black pepper and nuts and served with a salad. It was a little earthy for me, but it was a good combination. She liked it and I could see the appeal. The rest of us had a pasta dish with red sauce and meatballs. It wasn’t horrible just really mediocre and boring. Not sure what that says about the rest of their offerings, as this is supposed to be one of the better restaurants in town. It’s in a beautiful space, the beer is fantastic, and the owner is passionate and hardworking . . . I really hope the rest of the menu is more worthy of both the beers that accompany it and the space it is served in. As in Zlin, we had absolutely wonderful food in Luhacovice. If you think spas are all about tofu and vegetables, you are in for quite a surprise – in Luhacovice gourmet meals are part of the experience. Actually, you might want to skip the spa and spend all your time eating! I’m not a coffee drinker, but we had a fascinating tour (and free coffee) at the high-tech craft coffee shop Lazenska Kava in Luhacovice. Even as someone who doesn’t drink coffee, I’m impressed by what these guys are doing. We had an amazing dinner in the French Restaurant at the Alexandria Spa and Wellness Hotel. This was quite a treat, as it is one of the best, if not the best, restaurant in Luhacovice. Our host helped us choose meals that were delightful, but that would also expose us to some classic dishes. I started with a beet salad with chicken, walnuts, and spinach with pear puree. It was lovely. For my entrée, I chose the duck breast roasted on rosemary and served with chocolate and sweet potato puree. It was, of course, perfectly cooked and absolutely delicious! And, not only did I get my own luscious dessert, but I got to taste a few others. I don’t know that I’ve ever eaten so well. We ended our travel in East Moravia in style, with a tour and lunch at the lovely Augustinian House Hotel. A more traditional hotel than many of the spas in Luhacovice, Augustinian House offers lodging and wellness services for its guests. The hotel is beautiful, making the most of a long-abandoned historic building with a thoughtful renovation and gorgeous amenities in the spa and grounds designed to encourage mental and physical health. Of course, we were there for lunch, which did not disappoint. Lunch in the hotel restaurant Symphony was another multi-course extravaganza of dishes that were every bit as beautiful to see as they were to eat! Everything was absolutely perfect. And then our tour came to an end and it was time to catch the train back to Prague. A special thank you goes to all of my hosts in the Czech Republic, but especially Jiri Duzar of Czech Tourism for his vision and hard work making the TBEX conference and FAM trips happen; Zdeněk Urbanovský of East Moravia Tourism for eagerly sharing his vast knowledge, arranging a fascinating itinerary, and remaining cheerful even when his little troop was hot, tired, and a bit crabby; Dana Müller of the Zlín and Luhačovice tourist office for her over-the-top five star hospitality; and Mahulena Drakselová of Czech Tourism for being both a fun travel companion and the fixer of small issues. My husband and I used Amsterdam as our gateway to Europe. There were several relatively logical reasons for this (including a decent fare on Delta), but it wasn’t a great choice. Munich would be better because the distances are shorter and it has a better variety of connections to the rest of Central Europe. We flew to Prague from Amsterdam on Easy Jet. I was pleasantly surprised by Easy Jet. It wasn’t a super cheap option, but the price was still very reasonable – even with upgrades for carry-on luggage (our backpacks are too large to qualify as personal items), checked luggage, and priority boarding. They bundle the add-ons, so it made sense to get the full package since we needed more than one add-on. Their booking site is clear and easy to use. Our plane was in good condition and the add-on package made for fast and easy boarding. All good things. I’d definitely fly Easy Jet again. Note that without priority boarding, there is a VERY long queue. However, it was well-managed in Amsterdam to make it a line and not a mob. They are also very stringent on the allowable size of personal items and carry-on bags (hand luggage). I tried to book the Amsterdam/Prague flight on Czech Air, since we had a discount for the conference. Unfortunately, the discount was useless, because it covered a very short time period and could only be used on a round-trip flight originating and returning to the same airport. There just wasn’t anyway to make my schedule fit theirs. So I only used Czech Air for the return flight from Prague to Helsinki and only because it had the best flight schedule for my needs. Without a usable coupon, it was no cheaper than a number of other options. And, like all budget airlines, I paid extra for luggage, a seat assignment, etc. It was ok for a budget airline. It got me there. I preferred Easy Jet, but I would use Czech again if it was the most logical choice to get where I was going. I used Finnair to get back to Amsterdam to catch my return flight to the USA. There really wasn’t a lot of choice, since Finnair could transport me from a small town in northern Finland to Amsterdam in time to catch an afternoon flight to the USA. Granted, that required flying out of Kokkola left at 5:35 in the morning. But it’s light some time before that, so it wasn’t too bad. And the flight and transfers were smooth. As with Czech Air, I paid for a few upgrades. There’s nothing fancy about Finnair – especially if you fly on the lowest price ticket – but my flights were all on time and comfortable. As guests of Czech Tourism and regional tourism offices, transportation was provided for our FAM tour group. We traveled to and from East Moravia by train. Train travel in much of the Czech Republic is very modern. However, infrastructure limitations in the eastern part of the country make train travel a little slower and a little less comfortable there than elsewhere. It’s not developing world rail, just not always as spiffy as German rail. I love a good road trip, so my husband and I picked up a car in Prague as we headed out of town. That allowed us to explore where we wanted at our own pace. As we often do, we rented online through Rentalcars.com. Usually we don’t go with the lowest cost option. Instead we like to pay a little more to book with a Enterprise, Alamo, Sixt, or another big international brand. In the Czech Republic the international brands were so much more expensive (or simply unavailable when we booked) that I took a risk and went with Rent Plus. Although Rent Plus doesn’t have the greatest reviews, we got a decent vehicle in good condition and great service. Absolutely no complaints and I would use them again. On my tour we traveled by van along a mix of modern highways and quaint rural routes. As my husband found in other parts of the the Czech Republic and neighboring countries, roads were generally good, if narrower than we are used to. It’s a part easy part of the world to drive through. Signage in the Czech Republic was a bit confusing at times, but Google maps was usually quite accurate in all of the countries we visited. Overall, the Czech Republic and surrounding areas were good destinations for road tripping. We didn’t bike, but the Czech Republic has a number of regions that would be ideal for bike touring as well. What a great itinerary! Love the idea of a road trip that bypasses some of the bigger, more-touristed cities. Thanks, Irene. I like big cities, but after a few days I need something quieter where I feel like I can clear my head and actually get to know a place a bit. And there are so many interesting and lovely little places to explore! What a great itinerary of the part of Europe I have not been (except for Vienna). We would love to tour it like you did, in a car and with a lot of time available to get enough flavor of a place. Thanks for putting in tips about what to see, where to stay and where to dine. I hope you get there, Carol. We really enjoyed it and I’m hoping to get back and spend some more time in places we passed through too quickly as well as places we missed. Yes. And such fun people to visit it with! Hope you are well! Great post and a comprehensive itinerary. We’ve been talking the Czech Republic for years now, so this is very timely as we are considering doing something similar to your route. Thanks, Jane. I thought the itinerary worked pretty well. We could as easily have driven up through the eastern end of the Czech Republic instead of Slovakia –there is plenty to see in both countries. I am, however, a little disappointed that we didn’t have time to do more of northern and southwestern Czechia – there are some really beautiful parks we missed, as well as some interesting smaller towns near Prague. I recommend going there – it’s a pretty easy place to travel, the food is good, and the beer is great! Have a great trip! I LOVE this post! We are considering such a trip one of these days and you have laid this one out so nicely. This is definitely a keeper and I may even be in touch when we get serious about the trip with additional questions! You can tell how much work you did on this one – thanks! Thank you, Jackie. Glad you found it helpful and I’d be happy to provide more information as your own trip planning moves forward! I do much prefer Budapest to Prague, as it just feels less touristy and seems to have more to do (in my opinion), but I would like to see more of Czechia someday. Sounds like an interesting itinerary! We have friends that say the same, that they prefer Budapest to Prague. I haven’t gotten to Budapest yet – when planning our itinerary we decided we wanted it to mostly be a road trip with some smaller towns. Budapest was too far afield, so we decided to focus on the Czech Republic and a few nearby small cities instead of just doing the major city loop. And there was plenty to see and do right in Czechia!